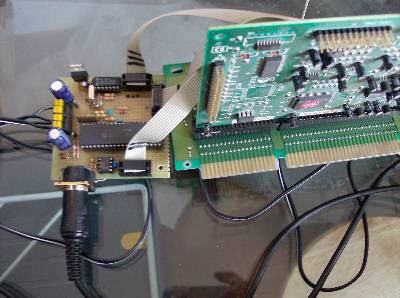 The circuit makes possible to realize a small MIDI expander using an old ISA-BUS soundcard. This microcontroller project based on micro PIC18F4320. Emilio, project designer, has tested on 2 different cards, and it should work for any card ADLIB OPL3 compatible (the I/O address MUST be 0x388). The software responds to MIDI commands on Channel 1. The sounds are generated by the FM synthesizer built in the soundcard. The power is derived from two low-cost wall transformers (see picture) with variable output, set to 9V (the output is close to 12V).